During 2008 I was only missing 4 bottles in my BenRiach collection. I couldn't fnd them in any shop online, so the onkly chance to get them was hoping to find them on an auction or find a person who had them and that were willing to sell them to me. I did knew a guy who had them and that's my belgian friend Bert Bruyneel. They were a part of his BenRiach collection, so to be able to buy his bottle seemed hopeless. In June 2008 I recieved an email from Bert: "if you want the 4 bottles you're missing you can buy them from me, but I have one condition. You ahve to buy my whole collection of 80 bottles of BenRiach." He gave me a price and it was more than reasonable, or actually it was a very good price, friend to friend. I didn't have the money so I phoned my friend at the bank and said I needed a loan. For what, he asked. To buy whisky, I answered. How much do you need? Said and done, the loan was fixed and I bought Bert's entire collection of 80 bottles. I went to Belgium in November to pick up the bottles and of course the most of them I alreday had. The best way to get rid of the doubles was of course to arrange a big BenRiach tasting. 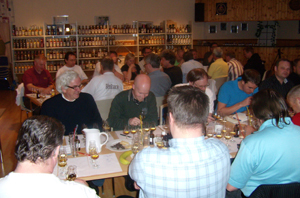 The date was set for 18 April 2009 and I quickly organized the tasting. 3 flights with 7 whiskies in each flight. One with 70's whiskies, one with 80's and one with 90's. There were also some 60's whiskies in the collection so I decided to include the oldest one, 1966, in the 70's flight. I sent an invitation to BenRiach and to my delight Alan MacConnochie, Distillery Manager at BenRiach said yes. I wanted to make a statement at the tasting as it was an important day for me in my collecting of BenRiach bottles, so I decided to put my collection on display at the tasting venue. My friend Hasse Peters helped me getting shelves and then we took my entire collection to the venue, 181 different bottles. The bottles filled the shelves and it was truly a wonderul sight to see my whole collection at once. Even Alan were impressed! 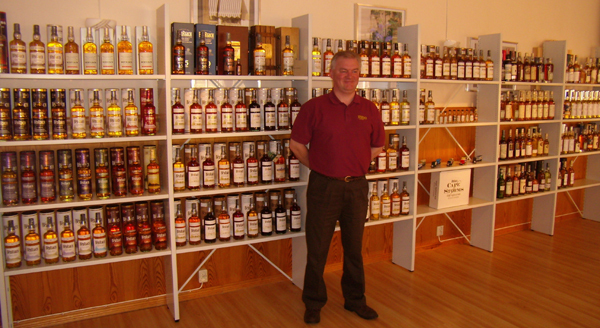 He said he didn't knew they had made som many bottlings and he enjoyed seeing them on display like that. He had mostly just seen the casks go away for bottling and never got to see the finished product. He thought it was especially fun to see the different wine cask finishes as he remembered the cask coming to distillery and choosing the casks that were going to get a wine finish. After the first break Alan was going to tell us a little about BenRiach and he was a little nervous, especially as he wasn't used to do the presentation after drinking 7 cask strength whiskies!